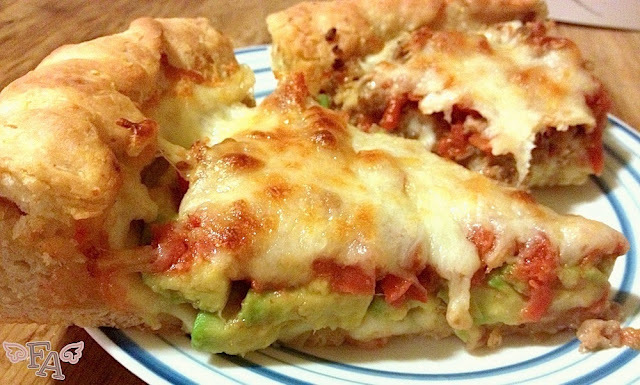 When I asked Maggie what's up with the halfsies on the pizza she responded, "You know Gansey is the avocado half. He has dangerously hipster tendencies." Stranded on the side of the road with his orange Camaro after a long night in a Henrietta, Virginia graveyard, Gansey, one of the main characters in Maggie Stiefvater's young adult, contemporary fantasy novel The Raven Boys, strips off his Aglionby Academy sweater adorned with the school's raven emblem, and tosses it into the back seat of the car. It lands on several items including a digital recorder, a flashlight, a willow branch, and a pile of old receipts with differing dates for Nino's large, deep-dish, half sausage, half avocado pizza. 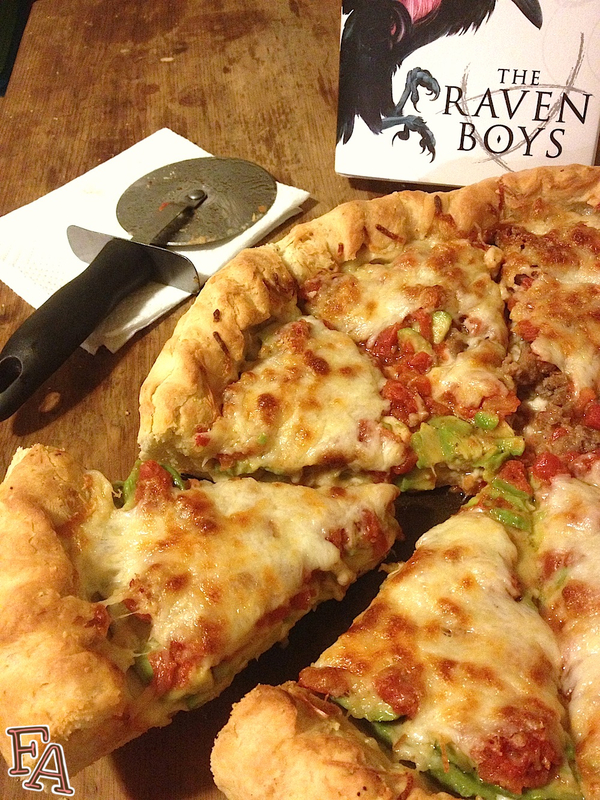 Going to Nino's and getting the halfsies pizza is a common ritual for four raven boys, Gansey, Noah, Adam, and Ronan. It's a place to cool off, a place to stay together, and a place to make plans for their next move to discover the sleeping Welsh king Glendower. It's also the place one night where they meet Blue, the holds-her-own female main character of the story who lives in a house of psychics and is like a battery for supernatural energy. 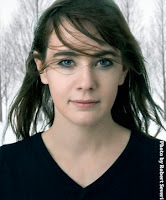 She becomes an indispensable part of their group, both in friendship and in the search for the sleeping king. 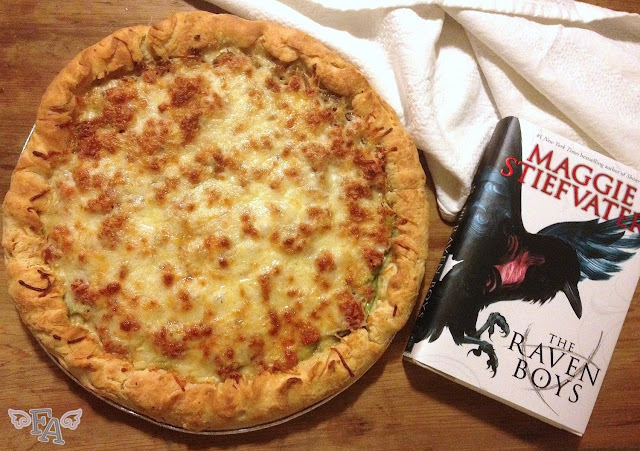 The half sausage, half avocado pizza appears at the beginning of the story as we are introduced to the characters, and is referenced at the very end, after we have become attached to those characters and don't want the story to end. 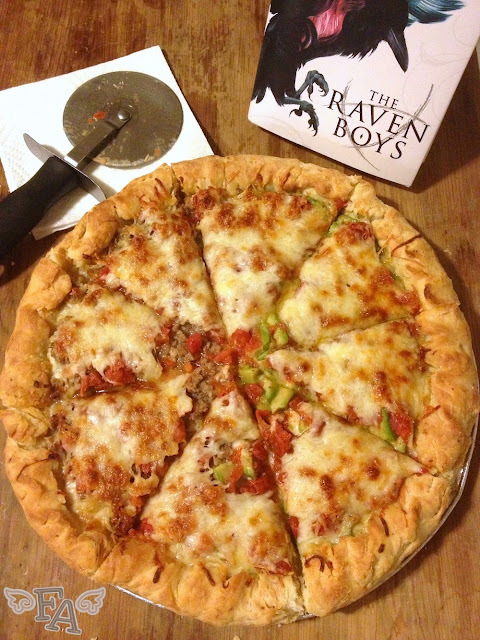 I would say that the "raven boys' pizza", aside from being yummy, is a relate-able, just-unique-enough-to-be-their-own, symbol of unity. A circular, cheesy, symbol of unity. For my review of The Raven Boys, please click here. Drink Note: Because the setting is Virginia and because Gansey is often chewing on fresh mint leaves and even has his own little mint plant, an appropriate drink for this meal would be mint iced tea (which I lurve!). Simply boil a large pot of water, add several mint tea bags or a bundle of fresh mint, and let it steep for a while until the flavor is strong. You can add sugar to taste if you like. Remove the tea bags or strain the leaves and pour the tea into a pitcher. Place the pitcher in your icebox until it is sufficiently chilled. ▽ Place the dough in a lightly oiled bowl, cover it with a towel, & let it rise for about 60 mins or until it has puffed up in size. ▽ Using your hands, take your puffed up dough & stretch it into a large circle. ▽ Lay the dough in the oiled pan & stretch & pat it toward the edges, building up the sides. ▽ Cover the dough & let it rest for about 15 mins. ▽ Drain your diced tomatoes if they are not already & then add the pizza or Italian seasoning. ▽ Uncover the pan of dough, make sure the dough is spread evenly over the pan & that the sides are built up. ▽ Bake for about 8 mins, or until it's stiff & just beginning to brown. ▽ Next, layer half of the pizza with the cooked sausage. ▽ Layer the other half with the sliced avocado. ▽ Put the diced tomato mixture on top of the sausage and avocado, gently spreading it as evenly as you can. ▽ Add the shredded cheese. ▽ Finally, drizzle olive oil over the entire pizza. ▽ Remove the pizza from the oven & let it cool for about 15 minutes before serving. * you can also use a mixer or bread machine. ♥ if you don’t have a deep-dish pan, you can use a different pizza pan, but make sure it has at least short sides in order to build up the crust edges when you are shaping the dough. A foil pizza pan that you can buy at the grocery store works just fine. ✭ if your ground sausage is not already cooked, now is a good time to do it. It's also a good time to slice your avocados & mozzarella cheese if you haven't already done so. ♦ sugar takes the edge off of the acidity of the tomatoes & makes for a more smooth flavor. ✢ putting mozzarella instead of sauce directly onto the bottom of the pizza crust keeps the crust from getting soggy & adds a wonderful flavor & texture. ∞ if you think the edges of your crust might get too brown, use strips of foil to cover the edges before you place the pizza into the oven to bake. I just wanted to thank you for the recipe! As a huge Raven Cycle fan, I just had to make this. It tasted awesome and my family loved it! Plus, your instructions were clear and direct which I really appreciate (especially since I've never made a pizza before)! Thanks, Lauren! I'm so glad to hear your and your fam. liked it so much! And thanks for the compliments on my directions, it's good to know they make sense to other people and not just to myself.